The “kinder+Sport mini tour” is conquering the world on two wheels and turning both little and big kids not only on to cycling but also motivates them to more sport and exercise in their everyday life. 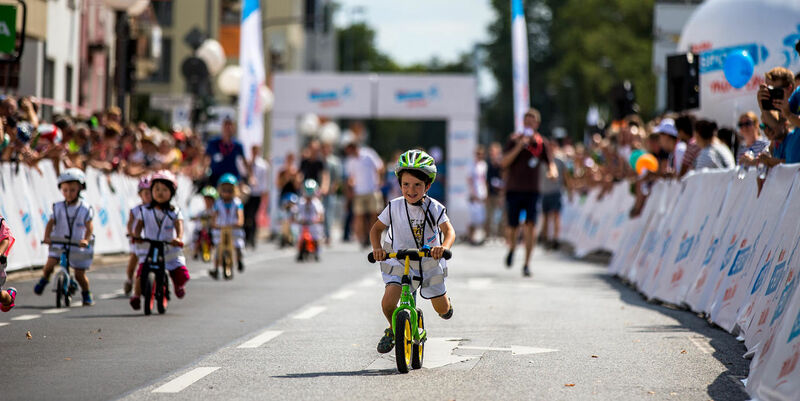 For little cyclists from two to five years old, the “kinder+Sport mini tour” is therefore sponsoring an exclusive race at ever stage of the Deutschland Tour – the Mini Tour. Taking part is what matters – every kid participating will receive a surprise at the finish. But that is not enough. All of the little and the bigger cyclists too can test and improve their skills on the bike with various modules and learning courses, all under professional direction. Riding slaloms, balancing over a moving ramp or taking on a challenging bumpy course – the training courses provide a lot of fun and great chances to experience a totally different side of cycling. The “kinder+Sport mini tour” was called into life by the “kinder+Sport” initiative with the goal of interesting children and young people with the fun of sport and offering them the possibility, to develop athletically and personally through directed training with professional support. Cycling is especially ideal to promote coordination and motor skills in children. Further information for registration for the Mini Tour will be published shortly.